The Bombshells series draws to a conclusion with a final battle against Hugo Strange and Killer Frost, as well as the mastermind behind the villains the Bombshells have faced. Supergirl and Raven both must face their pasts if they want to win. This final volume was a nice ending to the series, but not an entirely satisfying one. Quite a few main characters were missing entirely from this volume, including Wonder Woman, Batwoman, and Mera. Luckily, there is a sequel series to continue their stories. I'm not surprised that the book couldn't fit in every character since this series has a huge cast. But it did continue the stories of the ones who made it in the book very nicely. 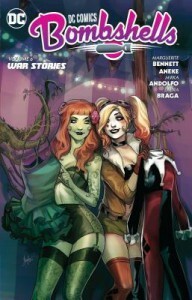 The book started with more of Batgirl and the Suicide Squad as they staged a rescue. They were only in the book for an issue, but their group dynamic was fun and I'd love to see more of them. Supergirl got a big reveal in her former home planet and her parentage that she had to quickly come to terms with and face in this volume as her birth mother's identity is revealed. She also got some nice bonding with her clone siblings, Power Girl and Superman, and Lois Lane (hopefully her future love interest). Raven also had to face her past when she met her father again. And her new-found family with Zatanna and Constantine continued to be adorable. Harley Quinn and Poison Ivy also continued to be cute, even if Harley had some very bad jokes that Ivy had to endure. From start to finish, the Bombshells series proved to be a fun ride with the ladies of the DC universe taking center stage. It took the simple concept of what the world would be like if the female superheroes came first and ran with it, re-imagining their dynamics in a World War II setting. And so many queer characters. I don't think there was a single issue that didn't feature a queer character, with most featuring multiple. I'm so glad there's a sequel to this because I loved every moment of this series and there's so many more stories that can be told with all the characters. And hopefully more DC heroines will join the series.